I remember this show, of course. 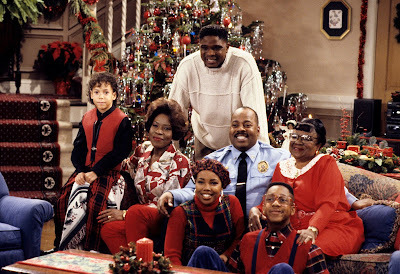 I think everyone who grew up in the nineties at least remembers Family Matters. What I hadn't remembered was that Family Matters is actually part of the Mypiot Cinematic Universe, which is to say it's a spin-off of Perfect Strangers. Harriet Winslow was a series regular on Perfect Strangers before getting her own show, along with her husband, Carl, who'd appeared in a handful of episodes. And speaking of Carl... he's played by eternal police officer actor, Reginald VelJohnson, who played a similar character in the perennial holiday favorite, Die Hard (assuming they're not, in fact, the same man). But any discussion about Family Matters is ultimately going to fixate on the series most famous character, Steve Urkel. Arguably television's most famous nerd, Urkel represents the personification of the stereotypical nerdy character years before Big Bang Theory would whitewash the concept and build an entire sitcom out of the idea. Unlike Perfect Strangers, this one just doesn't hold up. Reginald VelJohnson and Jo Marie Payton are clearly talented character actors, but not even they can salvage the writing. As for Urkel, we found him as annoying to watch as the characters on screen found him. The audience is supposed to sympathize with him, but - in addition to being a two-dimensional joke - he spends an uncomfortable amount of screen time sexually harassing Laura. Tragically, Family Matters had no shortage of holiday installments, so this is going to take a while. This was from the series's second season - the first and third were mercifully free of Christmas episodes. This has a couple plot lines. The first revolves around Urkel, who's home alone for the holidays. After casually harassing Laura and promising her young cousin Santa will bring him a hard-to-find gift, he clumsily knocks over their tree, breaking her favorite antique ornament in the process. She reacts... actually, the way you'd expect a sane human to react. She throws him out and tells him to never come back. But then she feels guilty, and her mom convinces her to go apologize (to her harasser). She finds him alone in his basement and takes pity on him. She invites him over for Christmas, which of course pleases him to no end. Meanwhile, Carl spends some time trying to find the aforementioned gift (sort of a Teddy Ruxpin knock-off). He almost gets one at the last store with any in stock, but loses it in a brawl with an angry mob (less interesting than it sounds). But everything's fine, because Santa brings it. No, really. This isn't completely out of the blue - there was an earlier sequence where Urkel argued with Laura and her brother about the existence of Claus. He "proves" Santa's existence at the end using a registered envelope where he'd asked to spend the holidays with his favorite people, the Winslows. If you're done vomiting, we can move on to the next episode. If you think the first Christmas episode was bad, rest assured things get worse before they keep getting worse. This season four installment features a quasi-spin on It's a Wonderful Life, only it doesn't actually borrow the premise correctly. Instead of showing a world where Laura doesn't exist, she's subjected to a world where her and Urkel's roles are reversed. No. Really. An angel shows up and starts showing off powers like teleportation and freezing time. He then forces Laura to experience a reality where she's an Urkel and Steve's a Winslow. New theory: Laura is already dead, and this entire series takes place in Hell. It's the only explanation I can come up with to explain this crap. The experience teaches Laura the error of her ways, and her angel rewinds time so she can react in a less empowered way. Also, she invites Urkel over for Christmas. Maybe all the Winslows are in Hell, because this episode centers on Carl and Urkel. Maybe I'm in Hell, too, because at this point there's a holiday episode every damn season. This one starts up with what's actually a semi-clever twist. Carl and Urkel are wrapping gifts on Christmas Eve, and CARL winds up breaking the crystal box he got his wife. It's not exactly funny, but I found it interesting in a sort of clinical way. They take off to buy a last minute gift and wind up on a subway car, which transitions into the episode's A-plot, which consisted of me watching my wife do an absolutely absurd amount of research into the Chicago subway, because the set dressers used a map of the New York Subway System with a Chicago label. If you ever run into Lindsay, ask her to tell you about the discrepancies between the kind of seating in the subway car presented in the episode and those that were common in Chicago at the time. It was really quite astonishing what she was able to uncover on her phone in a half-hour. Less impressive is this episode, which is mostly just Urkel convincing a bunch of angry Christmas shoppers to be nicer to each other. That's... pretty much the sum total of the plot. This time, it's Carl who invites Urkel to spend Christmas with them. Season six. This episode kicks off with a couple catalysts. First, Laura's brother accidentally throws out the beloved doll she's had since she was six, and she reacts to the news like she's four or five. Urkel overhears and heads to the dump to try and find it as a Christmas present. Meanwhile, the family's youngest member invites a homeless man to move in. Carl and Harriet allow him to do so for a few days, but only because he helps with the cleaning. He then tells Carl he's secretly Santa Claus. Carl naturally thinks he's crazy, but he then reveals knowledge of an unfulfilled Christmas request Carl had as a boy. The next morning, Urkel shows up with the doll (it took him 16 hours, but he found it), and Carl discovers a gift from Santa - it's the toy he wanted as a child! Instead of shrugging, since they already proved Santa's existence back in season 2, they just kind of look perplexed and wonder what the hell's going on. It's okay - I've been wondering the exact same thing. Apparently, the show decided Urkel was too subtle and allowed the actor to truly cut loose, because his portrayal here felt like a caricature of his earlier appearances (which already felt like a caricature). The central plot centers on Urkel and Carl again - this time it's around decorating. At first, Carl refuses to let Urkel (who I guess is living with the Winslows now) design their rooftop light display. Once he finds out there's a contest with a five-thousand-dollar prize, he changes his mind, only he lies to Urkel about his motive. Did I mention Carl is now written like a one-dimensional cartoon? The episode culminates with them dressed as Santa and an elf on the roof, which collapses under their weight, dropping them into the kitchen along with the entire display. Then they have a dramatic heart-to-heart where Carl apologizes for lying and Urkel forgives him. Think that's dumb? Wait until you hear about the B-plot. Laura and Eddie are too busy to help their mom decorate the tree, which depresses her. Their grandmother shows them they've been selfish by refusing to make Christmas cookies, a tradition they haven't outgrown. They feel awful, so they pull down all the decorations their mother put up and re-decorate the tree with her. Then their grandmother bakes cookies. This is after the roof collapsed into the kitchen, so I'm a little unclear how she made cookies in there, but that's what happened. The A-plot of this season eight episode centers on Urkel and Carl going into the woods to cut down a Christmas tree, getting lost in a snowstorm, making a fire to keep themselves alive, having a tender moment where they express their mutual love and respect for each other, then get saved by a Christmas miracle. But screw all that - I want to talk about the rabbit hole I fell down trying to figure out the B-plot. Laura is seeing two guys, Curtis and Stefan, without telling them about each other. Yeah, we're doing that old sitcom staple, but stay with me a minute. Stefan is played by Jaleel White, the same actor who plays Steve Urkel. Oh, and Stefan's last name is Urquelle. At first, I thought this was some sort of bizarre joke - the episode offers no real information. But five minutes on Wikipedia reveals he's a clone of Steve Urkel who was genetically modified using a Jekyll and Hyde-type formula. Apparently I'm watching the wrong episodes of this show. At any rate, Laura's mom sits her down and tells her about a similar experience in her own life when she'd dated two men and wound up hurting one (she did not say whether either was a clone, as in her daughter's situation). Laura breaks it off with Curtis, so she can continue seeing Stefan. Who, just to reiterate, is a CLONE OF AND CREATED BY A BOY WHO'S BEEN STALKING HER FOR HER ENTIRE LIFE. The episode ends with the core cast admiring the tree. This one from the ninth and final season mainly concerns two separate stories at the mall. First, Carl has to fill in as Santa to help his wife. Second, Urkel is working with his girlfriend, Myra, at the gift wrapping counter. Essentially, nothing of consequence happens. Here's what happens that's inconsequential. Carl is initially annoyed by the job, but he starts to care after a kid tells him all he wants for Christmas is for his dad to get a job. Carl gives the kid his business card and tells the kid to pass it on to his father. This is played as meaningful for some reason. Meanwhile, Urkel is too careful and methodical while wrapping - he's a perfectionist. This angers Myra, since it's costing them money. The customers aren't happy, either, since it's taking far too long. This culminates in a surprisingly decent moment where Urkel is grabbed by the crowd and wrapped in paper. There's also a C-plot where Richie is sad his mom gets trapped out of town by a blizzard and can't make it for Christmas (queue canned audience sad sounds). Eddie drives all night in order to pick her up, so no one learns to handle disappointment. And... that's it. These episodes were pretty awful. Perhaps the non-holiday installments featuring robots, clones, and trips into outer-space are better (I wouldn't bet on it, though), but you should probably avoid the Christmas ones.